Boulder County, Colo. - The people of Boulder County have many stories. While the tales of prosperity, success, and acceptance are shared again and again, the stories of those who struggle in the community are often either not told, or not heard. The (In)visible Boulder County project aims to change that. Join the Boulder County community dialogue on Thursday, Sept. 14, at the Dairy Center for the Arts in Boulder to see the documentary film, view the portraits, and truly hear the rest of the stories. While people often see struggle and inequality elsewhere in the country, there are many in Boulder County who face the same challenges. Eleven percent of families with children in the county live below the poverty line. Thirty percent of county LGBT teenagers are victims of bullying at school. Understanding the issues people face is often the first step towards making a difference. The (In)visible Boulder County project does this by bringing to light the stories of the often marginalized and underserved populations in the county - the immigrant, working poor, transgender, homeless, and youth-in-crisis communities. The doors to the (In)visible Boulder County event will open at 6 p.m., with the portraits on display in the Dairy Center lobby. Representatives from the Boulder County organizations and area non-profits whose clients took part in the project will be on hand, along with the creative team from One Thousand Design. This event is sponsored by Boulder County Community Services, One Thousand Design, and KGNU Community Radio. The (In)visible Boulder County project was created by One Thousand Design as part of the Sonder Collection, in partnership with the Boulder County Community Services Department. It was sponsored by the Boulder County Commissioners and other community partners, and has been regularly featured on KGNU Community Radio. The project was produced in conjunction with the Boulder County Circles Campaign, Boulder County Head Start, Attention Homes, Emergency Family Assistance Association, Intercambio, Out Boulder County, and the Sister Carmen Community Center. 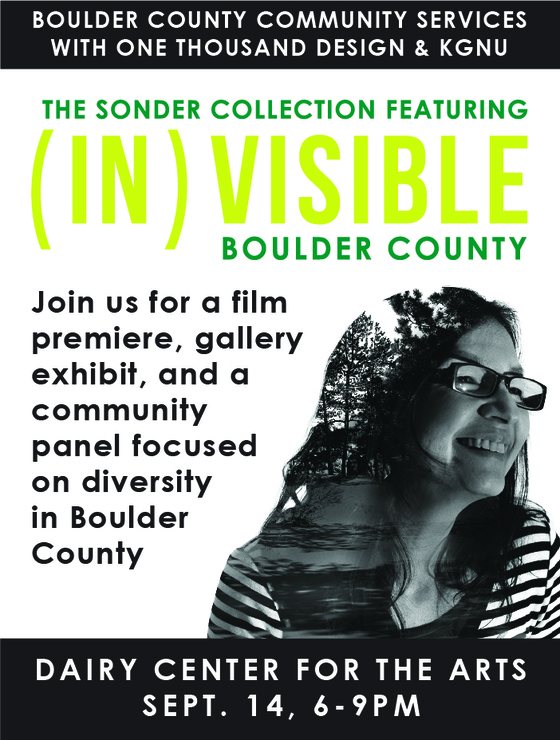 For more information, visit the (In)visible Boulder County and Sonder Collection websites.